MANILA, Philippines - As usage of smartphone devices grows, so does the consumption of content. More and more brands are moving from traditional to digital when communicating with their target audience. Clearly, digital has changed the game and this presents opportunities for brands to get even more creative with their ideas. 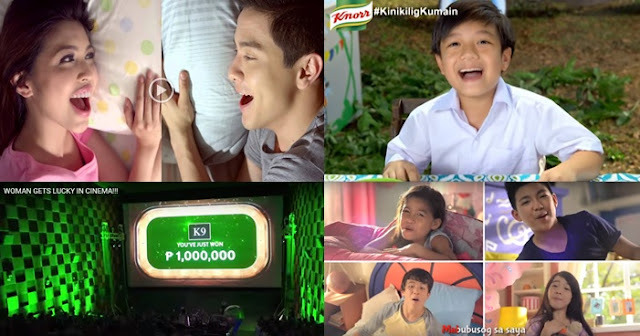 Most viewed YouTube ads in PH. Screengrab from Youtube. Take video ads, for example. Now that digital has come to play, videos are no longer just viewable on TV but has found an extended home on the internet where it can reach a wider audience by the millions. This made brands create longer storylines and get more personal and real-time feedback from consumers. Although the power of online videos is undeniable, a more important question is, what type of video content resonates the most with audiences? According to Google Philippines Country Manager Ken Lingan, creating video content and simply sharing it on a video-sharing platform like YouTube do not guarantee views because consumers still have the power to skip ads. What really matters is the quality of the content. “Authentic story, coupled with a complete understanding of consumer passion, is still the key. The platforms may change, but what has not changed is the desire for dialogue and stories. Brands have always been one of the best storytellers and they now have the opportunity to re-fulfill this need,” he said. To recognize the top-viewed YouTube ads in the Philippines, Google released the YouTube Ads Leaderboard for the second half of 2015. It is the first time that all the ads on the Leaderboard are local and because of this, advertisers now know what types of digital content get more attention from Filipino audiences. Ramon Garcia, managing partner at McCann Worldgroup, the creative agency that worked on the Chuckie commercial, emphasized the importance of knowing what the brands stand for. For Chuckie, it’s the concept of “active play” where moms play a major role. This resulted in content that made viewers remember their own mother-child bonding moments. Lady’s Choice Maine Mendoza sinurpresa ang pamilya Mendoza ng Laguna! ad has a different take on Filipinos being family-oriented. Although Maine was featured in the video, it is the Filipinos’ love for family reunions that makes the ad relatable. Eskinol’s Wattpad webisode, landing on the ninth spot, also shows a different way of extending reach via digital. Despite being over five minutes long, the ad caught the attention of the viewers because of its take on teenage love and attraction. Viewers even took their sentiments to the comment box and expressed how they could not wait for the next episode. One viewer even mentioned that it was her first time to finish an ad despite its length.